Job seeking may not be that easy task. It does require a lot of inputs and understanding of the people who may be taking you for a job. However, during a job search a big difference that should be understood by any candidate is that between retainer and contingency recruiters. They ease your process in getting the job. Contingency and retained recruiters are very helpful when it comes to seeking job with the companies. It is through their sources that one will be able to get any job/ permanent job with the company. Here the recruiter will charge a direct fee to the client for getting any employee. Their operation is conducted quite on an exclusive basis and they will thoroughly conduct a search to know who the right person for the job is. They will work so hard to find that perfect employee that they will make sure the vacancy for the job is filled only and only through their recruitment agency. You must remember that the industrialists and company are also In need of good candidates. And as these workers work very closely with the clients, they know what the needs are. They will have to follow a work process which makes them catch the right person. Thus, now the candidate’s challenge is not to get selected by their company but the retained recruiter. The trickiest part of job is done by a contingency recruiter. Quality and speed is what they skill upon the most. Their search on the other hand is driven on a bargaining .Their work is to choose the best employee for the job according to the way they want to operate. Now, the contingency recruiter is not paid any fees for getting the candidate. He or she does not even get the remuneration from the candidate himself. It is also known as No win, No fee or No cure, No pay kind of service. However there is a catch. 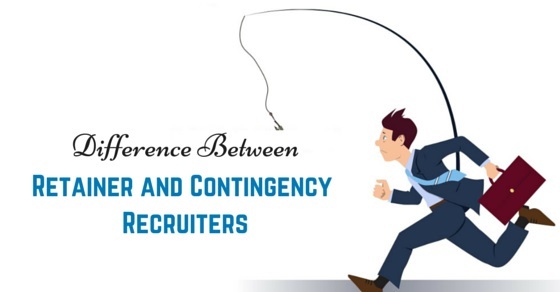 Recruiters who are belonging to the Contingency category basis may often have to compete with other agencies that are working. As a contingency recruiter only gets paid a commission when his chosen candidate gets the job of the client. Thus it is a quick job. The contingency recruiter competes with the internal HR department; direct applicants, retained recruiter. One must also not forget advertising and other recruitment companies. It is a huge challenge for both the types of recruiters to be selected and awarded. The cash however lies on the kind of candidate they choose to be brought to the forum. However, it is not going to be that easy for a retainer recruiter. It is generally rigorous with a basic shortlist of anything from like three to even ten names being presented. The advantage is that the retainer recruiter will be at an upper hand as it is only with them that the company has a word with. The retainer recruiters are given an upper hand over the HR department or any other source. For a contingency recruiter, however, the bait is high. The trick here lies to represent the best candidate or a group of candidates and also do this faster than the other channels. If the vacancy looks too hard to be filled, chances exist that very few candidates who will be responsible will be hired. For a contingency recruiter, it is actually very difficult. It is their speed and refined skills that help them do it faster than the others is what define them. If you thought that the retained recruiter is provided always with a silver spoon, you will not be wrong. He or she has the perfect luxury of time to complete their duties. The retained recruiter takes their own sweet time to get the things done right using various processes and also agreed methodology. To get that particular assurance that work will be done faster, they will have to finally fill the position thanks to their unique terms. Another advantage a retained recruiter has that he has given the guaranteed assurance to his or her candidates of being suitable qualified for the job. This after having taken certain commission of the money, if the candidate gets in it’s an all profit for him. The candidate does not and cannot pressurize the recruiter for time as well. One would believe the chase for a retained recruiter is easy but it is not so. After a candidate has paid some amount of money to the retained recruiter, it is going to be a difficult process for him or her to do the given job in time. If you get to see, till that specific time, the candidate will have to remain with his or her recruiter. As the retained agency or recruiter has signed up to proving a certain amount of service, sometimes the afgency who are involved with retained search can be very difficult and these projects can actually turn out to be rather lengthy. For a contingency recruiter, the ball game is totally different. As he or she has to faster than the pace of another agencies and also he or she does not get any pay for whatever done, the contingency recruiter will simply arise and thus move on to another vacancy or client where they think they will be able to provide a better candidate and thus get the price. This flexibility of nature for contingency recruiters also makes them an ideal choice sometimes among candidates. Thus, for a candidate, the situation is going to be not that tricky or difficult. If you are a candidate and you know there is a vacancy somewhere, you will be obviously ask the recruiter to assist you. The recruiter, then with all his possible sources tries to find a way to get you in. He or she will also gauge how tough the competition is. Thus, the game is different for everyone. The candidates are given a certain more benefit with the retained recruiters. The benefit on that front will be a little better if you are more likely to get full briefings on the given role, the interviews and also the potential offer and so forth. However for a contingency recruiter, the ball game differs. Their learnt skills and experience in the field is what defines them better. The situation completely differs for a contingency recruiter. They have observed a lot and have idea of different companies, a candidate may prefer contingency recruiters for their exclusive and pro-active skills. Though they may not be getting a perfect commission required for their job directly but it does call for them to keep their contacts open always. Thus, the candidate will get a job because of their rough and witty methods. It is the rule of nature that you are not going to be benefitted with anything . As a candidate, you tend to clearly have a payment choice. If you are a retained recruiter, you will get the desired commission from your candidate. The employee seeking the job will also have to give the desired quota to the retained employer agency. Thus, for a candidate it is worth the money if he or she is selected for the job. On the other hand, however, it is not the same for a contingency recruiter. You may want to go to them because they do not charge a direct fee but however you will be forced to pay them once you reach the client’s position. However, if you do not get selected then it will also be considered a sheer waste of time. Thus, the trick and tip of wisdom with a contingency recruiter is to not completely rely on them. Try and always keep a back up for a contingency recruiter. Thus, as you see the choice to make is easy if you know what you want. With the demands in job increasing day by day, everything depends upon the kind of job you are hooting at. That will obviously make it clear which recruiter to choose. If you are ready to give big buck, choose a retainer or otherwise stick to a contingency if you know your success ladder will be a quick one. However you need to be wise. These recruiter, be contingency or retained will ensure that your efforts are recognized and you get worth what it is for the money. You are not cheated of the time. However in this profession, it is the company also which is inadvertently making profit as it is them who are always being benefitted with an employee for their organization, with the required set of skills. Remember to give the recruiter their due.